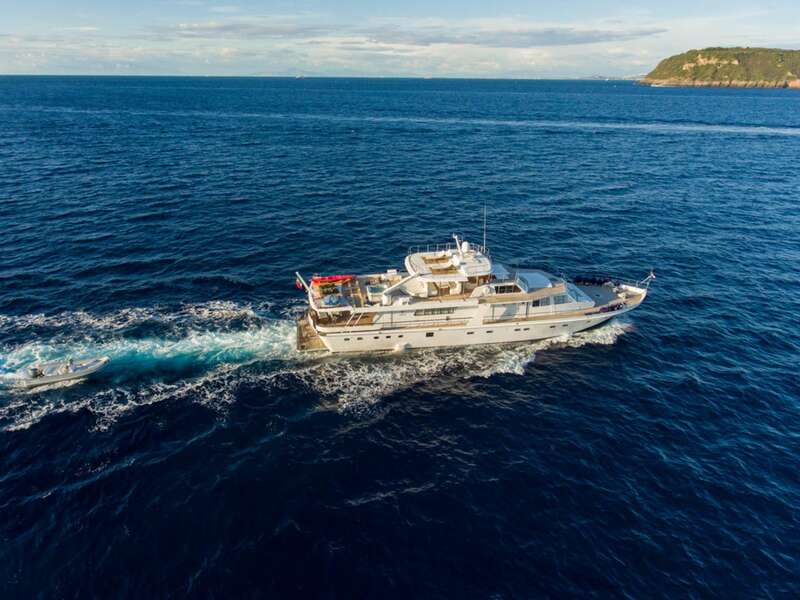 A splendid example of Italian shipbuilding, Nafisa is a classic “Gentlemen's yacht" with its expansive deck spaces that make her ideal to those who really wish to experience life on the sea. Rebuilt in 1995, Nafisa is in excellent conditions also thanks to several refits and upgrades, the last one in 2019 that included, among others, the creation of a new ensuite bathroom for the main deck cabin and the building of a beautiful sundeck over the current shaded alfresco dining area, to offer extra space to sunbathe and enjoy the surrounding panoramas. 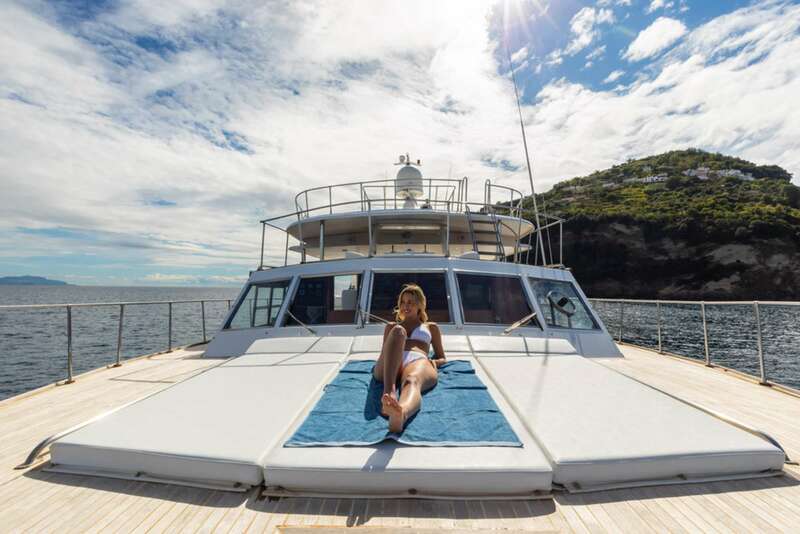 She offers comfortable accommodation for 10 guests in a magnificent full beam Owner' s stateroom, a VIP suite, 2 spacious twin cabins and 1 additional double cabin. A sofa bed in the main salon offers additional accommodation for two additional guests. 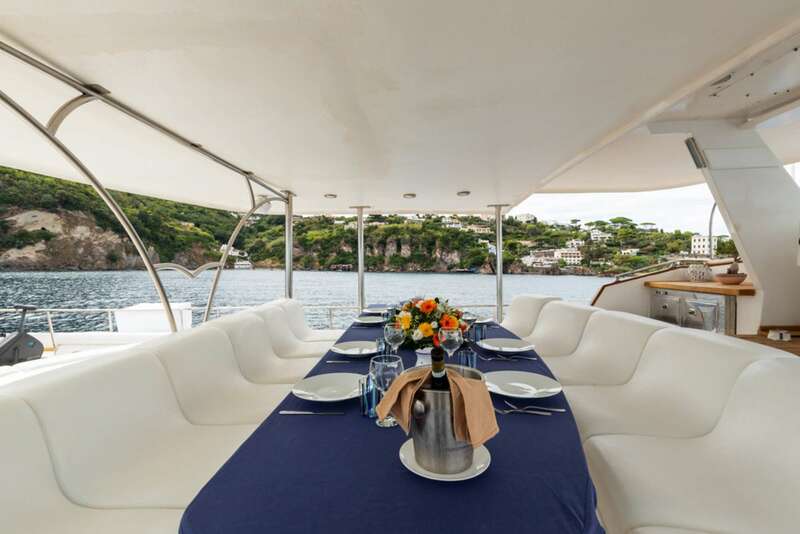 Nafisa boasts very ample open spaces, offering a variety of different seating and lounging areas: on the fly bridge, two huge sofas, an al fresco dining area and a fantastic 4 seats Jacuzzi to relax while admiring the breathtaking views of the Mediterranean landscapes. 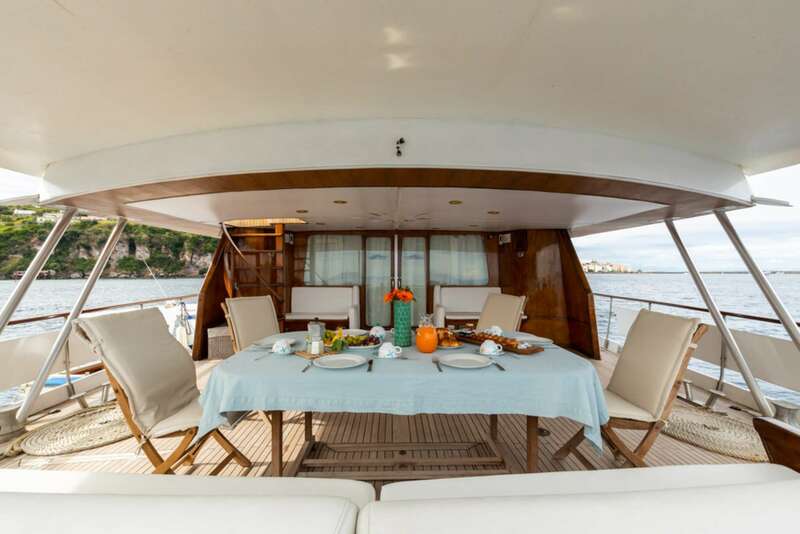 On the main deck Nafisa hosts a huge salon, a beautiful relax area at stern with a coffee table and sofas and a beautiful solarium on the foredeck. She also boasts a full gym equipment with stationary bike, stepper, yoga mat, weights, kettlebell, elastics, resistance band. Nafisa’s cruising speed is 16 kn but she can cruise at a lower speed of 11 kn with a reduced fuel consumption of 220 Litres/Hr. 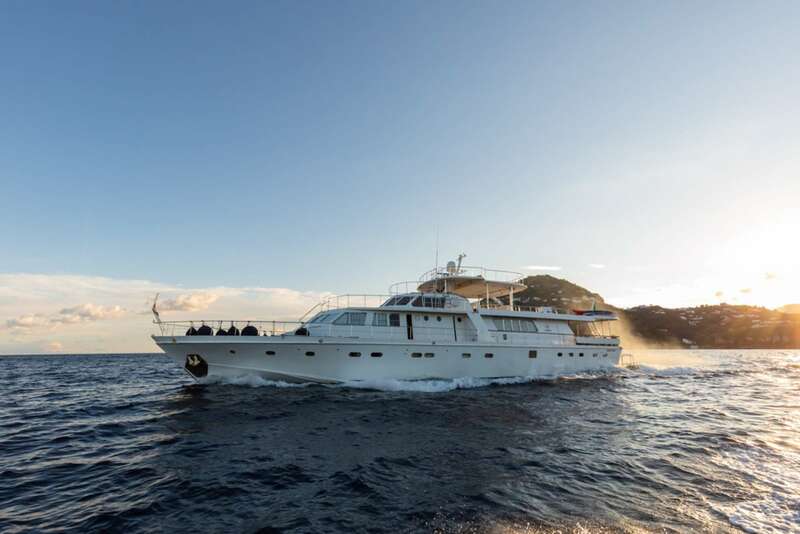 Stable, comfortable and stylish, Nafisa is the perfect choice for unforgettable cruising holidays. 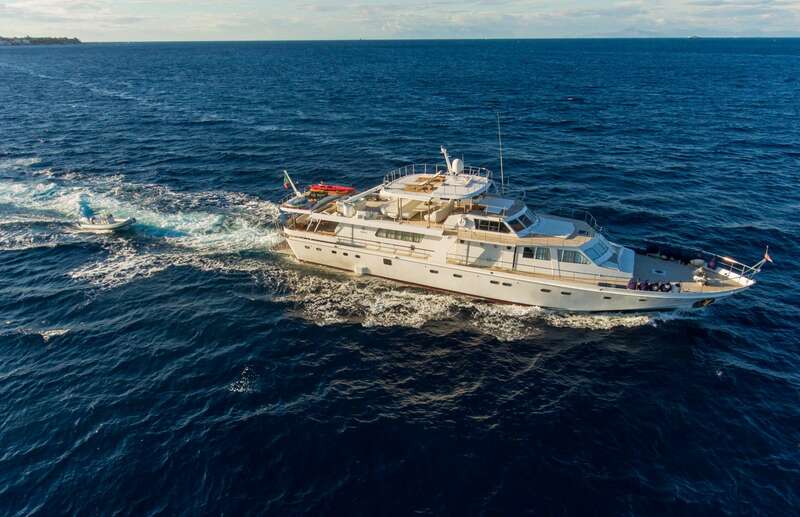 Nafisa offers excellent accommodation for 10/12 guests in a magnificent Owner's stateroom including full widht, one VIP guest's suite, 2 spacious Twin cabins en-suite, 1 brand new double cabin located forward. A sofa bed is available in the main salon for two additional guests.